Life here in the Rio Dulce has settled into a daily rhythm, and things have begun to move in a sedate and predictable manner. Life is steady, possibly even monotonous. Weekdays, for the most part, follow this general pattern: get up early, do school for five hours in the tropical heat, call it quits and play basketball in the afternoon, go for a swim, take a shower, play video games or watch an episode of Star Trek before dinner, eat, go to bed. Weekends are a little different, but are still predictable. On Saturdays, Aaron and I go volunteer at an orphanage, and work our butts off for most of the day. We are often accompanied by Deon, a friend of ours from South Africa. We work in the dirt until the afternoon, when Jerry (the house father) drives us home. Then we swim and play for the rest of the day. Sundays, we have a pancake breakfast and goof off in the afternoon; sometimes Dad takes us wakeboarding on Lake Izabal. Not that there’s anything necessarily wrong with a repetitive week, but for people who are used to changing locations every few months, it can get a little dull. So we leap at any opportunity to break the trend, get out of the boat (and school) for a day, and do something awesome. Our marina in the Rio Dulce is in the shadow of a national park on a large mountain covered by lush rainforest. Our friend Jerry from the orphanage where we volunteer is often lovingly referred to as “Jungle Jerry” because he leads rainforest hikes on occasion. We asked him to take us into the jungle and he agreed to take a day off and show us a part of Guatemala we might not otherwise experience. I didn’t quite know beforehand what it would be like. All I knew was the general area where we would be hiking (in the hills further down the river), how we would get there (in Jerry’s little SUV), and what time I had to wake up (7 a.m.). The early hour was possibly the least pleasant aspect of the outing, but it was well worth it. We packed lunches, snacks, spare articles of clothing, a camera, and water bottles in two backpacks. We put on sturdy shoes and hopped in the dinghy. Dad drove us over to the restaurant where Jerry would be picking us up. On the way, we grabbed Deon. Jerry was waiting for us; Mom, Aaron, Deon and I piled into his vehicle and drove off. We drove over the bridge and soon left the noise, chaos, and urban squalor of Fronteras behind in favor of the tranquil scenes of pastoral squalor that comprise much of Guatemala. Jerry told us entertaining stories about his childhood in Guatemala and his life in the U.S., including his time in the Marines. Suddenly we turned off the highway and became off-road explorers. Such radical changes in terrain are quite common here. One minute, you can be driving down a well-paved road with flat pasture-land on either side, and the next, through dense hilly rainforest on a muddy track, rattling your teeth out as the road dips and bumps over rocks. Jerry’s vehicle is a hardy off-roader, an Isuzu Amigo, the sort of car you get when you cross a jeep wrangler with a pickup truck and drive it around for a few years on bad roads. It has seats for five, but by Jerry’s count, it can carry up to ten people (an assertion we put to the test on one occasion). It has little in the way of comfort, but she’s got it where it counts. We drove for almost an hour on prodigiously bad roads, through two shallow rivers, and deep into the hills. 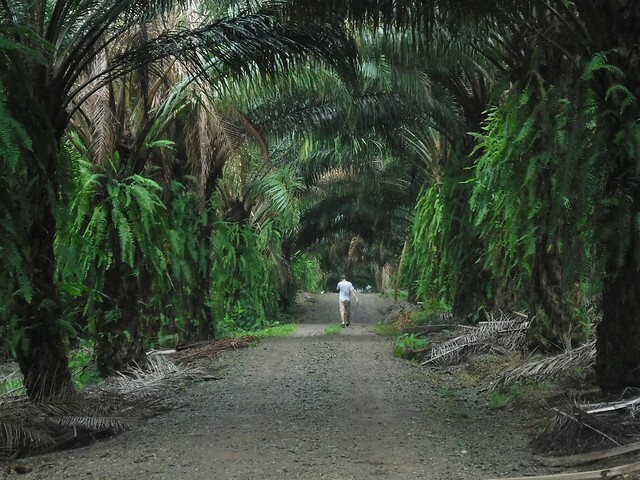 The land near Rio Bonito was verdant and cultivated with palm oil plantations which rose up on either side, covering the road with a green arched roof, with the overgrown trunks forming ranks of shaggy green pillars. We stopped and disembarked. Jerry took his vehicle a ways down the road to park, and came back with two local guides and a few scrawny dogs. In single file, we followed the guides (and dogs) off the road. At first the path went through the palm plantation, and the ground was muddy and dotted with cow manure. Then the orderly rows of palm trees ended, and we began to ascend. The path became narrower, and the guides up ahead hacked away at the encroaching vegetation with machetes. The dogs ran off into the woods to hunt. Sounds of their chase would echo back to us from time to time. The trees were very thick, and covered with vines and moss. The slowly-rising ground was split by roots and covered with fallen leaves. The air was humid and heavy, but not too hot as the day was mercifully overcast. But the path snaked ever onward and upward, and it wasn’t long before we were perspiring like professionals. The trail went up and up. It was often very narrow, cutting into the side of the wooded hills. The sound of insects filled the air. Aaron and I traded off the big backpack every now and then; Mom, puffing behind us like the Little Blue Engine, carried her own small pack. After about an hour of trudging upward, enveloped in our own personal banks of fog, we reached the top of the hill. We waited for Mom to catch up, then we trudged down the other side. The other side was lot steeper, and we found ourselves stumbling and sliding as often as walking. Before long, we reached a broad, shallow, and fast-moving stream. 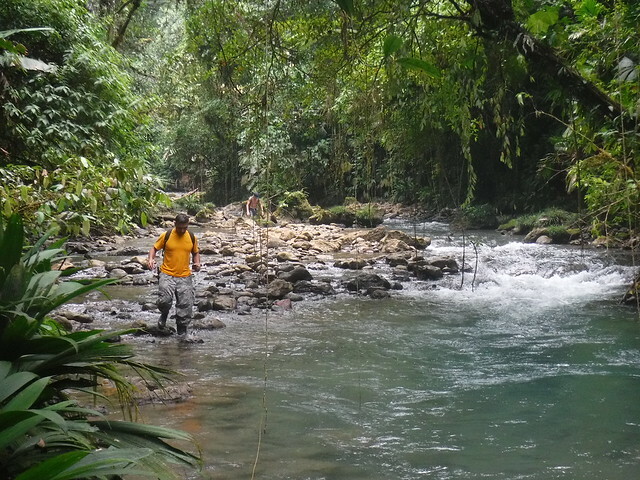 We took off our shoes and waded across, then continued upstream. I didn’t catch on to the fact that this was a waterfall hike until I could see the waterfall (although the name “Rio Bonito” should have cued me in). And what a waterfall! It rushed out from a wide gap between two great piers of black rock thrust out from the sides of the valley, and tumbled into a series of deep pools, each turquoise pool hidden from the next. We took off all unnecessary clothing items and began the exploration of the falls. The water was frigid and fast-moving. Diving into the turbulent pools, we discovered tunnels that ran under the rock. 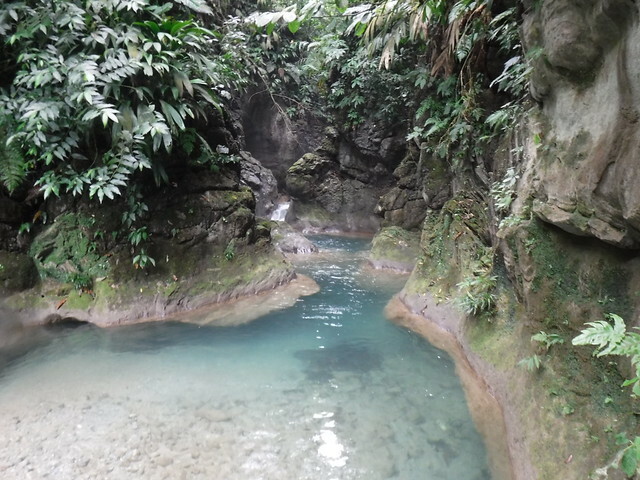 We scaled the rock faces, swam and climbed up the curved canyon, and found more pools and falls. It was otherworldly—like something from a movie set. Mom followed us up the first canyon, then swam back to relax and eat lunch. One of our Mayan guides hunted snails by the rocky pools, his faithful dogs following him around, leaping from rock to rock over swift-moving water. Climbing up icy waterfalls in your underwear may be fun, but it gets pretty tiring after a while. So we swam over to the small rock island downstream where we had dumped all our stuff. We opened our weighty backpacks and lightened them a little. After a delicious lunch of sandwiches and carrot sticks, we donned our clothes and shoes, and plunged back into the jungle. The way back seemed easier, probably because all that uphill we did at the beginning was now mostly downhill. Now that we weren’t straining to get up the hill, we were free to enjoy the surrounding wilderness in relative comfort. As an added plus, the sun had finally come out, bathing the forest in a pleasant, green, leaf-filtered light and warming us after our brisk swim. The trail ended, but we continued down the road toward the village where Jerry had parked his vehicle. The palm plantation dissolved abruptly into rolling sun-drenched cow pasture. The walk to the village was long, and we talked while we ambled, with the dogs barking and chasing cows in the background. The village was small and indigenous, something I usually associate with grime and poverty, but this place was immaculately clean. Most of the buildings were elevated on stilts, with hand-cut board walls and palm-thatched roofs. Colorful blankets fluttered from clothes lines. Hammocks hung on porches. Women washed clothes down at the river. It was very National Geographic. Jerry told us that when he first visited the village, the children were afraid of Gringos eating them (a threat parents made to get good behavior). Apparently, they were still afraid, because there were none in sight. Just tiny Mayan eyes peeping out at us from window cracks. We reached the car. The guides produced coconuts and speedily lopped the tops off with machetes, then handed them out as refreshments. We sipped the coconuts, tipped the guides, and drove home. The hike showed us a Guatemala we had not seen before; long ago, the entire country must have been like this, blanketed completely by trees and undergrowth. Now, the landscape is a patchwork of cattle-strewn grassland, dense groves of banana trees, and orderly ranks of rubber-trees or palm-oil plantations, the rainforest held back by machetes and a few feeble strands of barbed wire. But the jungle remains, thick, dark, and lush, lurking just beyond the property lines.